For a simple view of parishes, I refer you to my own online map (44K). See also Bibliography, Gazetteers, Land Records and Aerial & Satellite Views. I do not sell books! The small prices at the end of some listings are there as a guide only. In an effort to improve my library (at modest cost) I am interested in obtaining copies of books marked . Please contact me with details if you have these on offer. I also have an online Ordnance Survey map (200K). More information regarding this and other current and historical maps can be obtained from the Ordnance Survey. Barker, Katherine and Kain, Roger eds. Maps and history in South West England; University of Exeter Press, Exeter: 1991. ISBN 0 85989 373 1. Quixley. 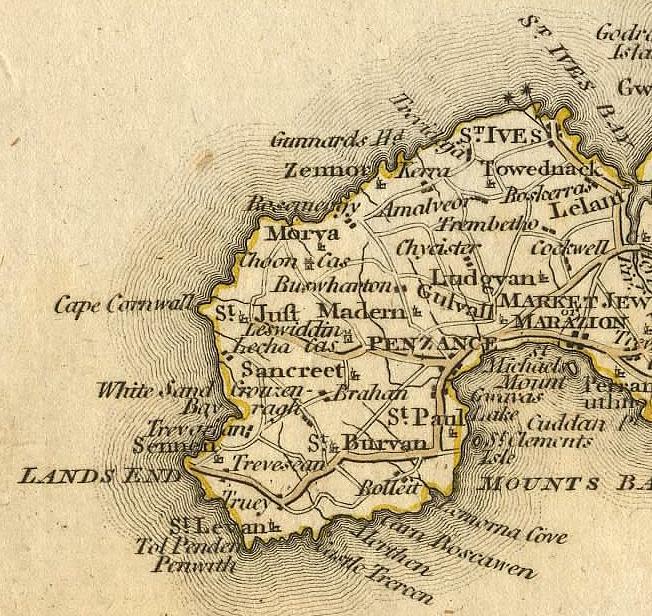 Antique maps of Cornwall and the Scilly Isles; . Christopher Saxton c1574. This is a county map created as part of an atlas of England and Wales and effectively commissioned by Queen Elizabeth I. 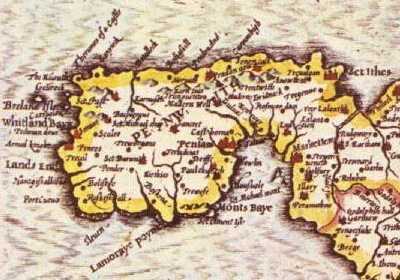 Made with the threat of a Spanish invasion, this was the first complete mapping of the country. A book which contains the whole set in their bright original colours and with an introduction by William Ravenhill is “Christopher Saxton’s 16th Century Maps—The counties of England and Wales” Chatsworth: 1992 ISBN 1 85310 354 3. There is a scan of another edition (rather nicer I think) on the University of Pennsylvania’s Introduction to Renaissance Studies page (second from last thumb-nail in “Section 1: Introduction” 400K). John Norden c1597. This edition consists of a county map and also maps of each individual Hundred. The survey was based on that of Saxton but considerable extra work was done by Norden to add detail. An excellent collotype reproduced set of an original manuscript copy with commentary by William Ravenhill was published by Exeter University in 1972 (SBN 900771 35 6).£32. Speculi Britanniae Pars: A topographical and historical description of Cornwall; William Pearson, London:1728.£1600 These are the same maps but engraved and with additional text added. 200 were published but Reprints remained available until the C19th despite better being available. This has been reprinted in Newcastle upon Tyne: 1966. £25 The late Brian Jelbert had an online scan of the Penwith Hundred (110K) which has been preserved by his brother Roger. John Speed 1610. This is a county map from an atlas of the whole of Britain all based on earlier works, mostly of Christopher Saxton. 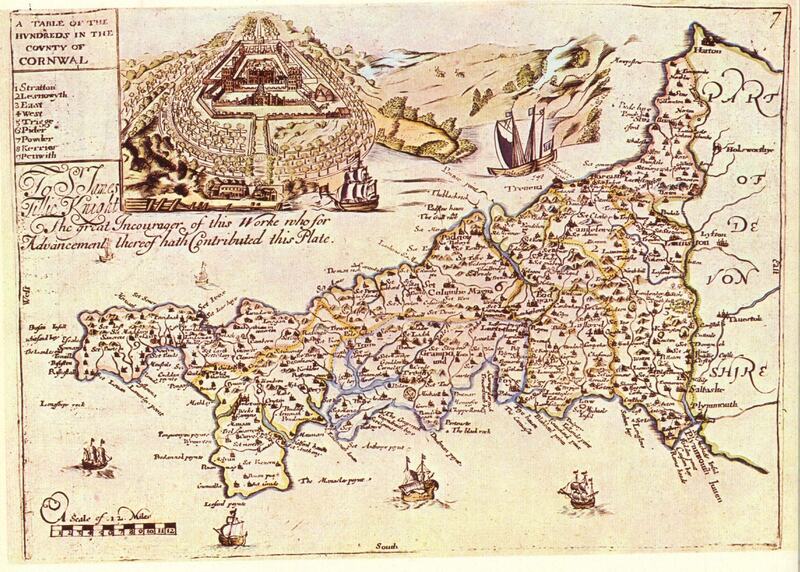 It is widely available in facsimile published on “parchment” by The Olde Map Company of Penzance. A book which contains the whole set in contemporary colourwash and with a commentary by Nigel Nicolson is “The counties of Britain—A Tudor atlas by John Speed” Pavilion in association with the British Library: 1988 ISBN 1-85145-131-5. I have also seen smaller volumes with a subset of the maps e.g. just the West Country. Alan Stanier has a complete scan on his Cornwall (Link Broken 17 Mar 2015) page (560K) or for a more manageable extract of just West Penwith. Johan Blaeu/Bleau 1648. I don’t know a lot about this map or it’s Dutch cartographer, but it is similar in content and style to the John Speed and hence, indirectly, to the one of Christopher Saxton. David Trounce has a scan in four parts (c350K each) on his page from which I have extracted West Penwith. Richard Blome 1673–85. Jon Quixley informs me that there were three editions of this map. The first published in 1673 dedicated to John Granville, the second edition first version published in 1681 (very rare) dedicated to Hender Roberts, a second version again dedicated to John Granville and a third edition in 1685 dedicated to James Tilie. A scan of this third edition (490K) was on Alan Stanier's web site which has now vanished so I have uploaded it here. The Lanhydrock Atlas (probably by Joel Gascoyne) 1693–9. 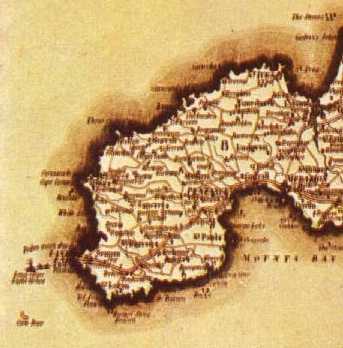 258 large scale (1:4000) maps of Lord Robartes property scattered all over Cornwall. Nine of these, located in Penwith, are reproduced in the book “Three Hundred Years on Penwith Farms” Penwith Local History Group: 1994 ISBN 0 9524744 0 9. Grenville Collins 1693. Land’s End and the Isles of Scilly chart 18" x 22". Robert Morden, 1696. 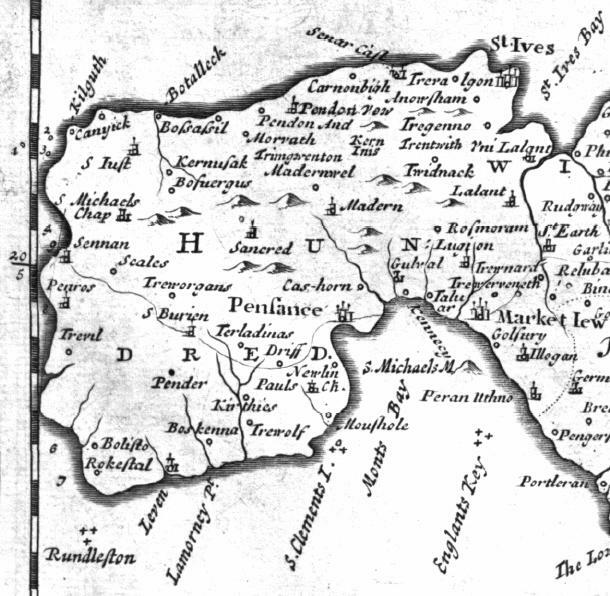 This map was published in the Gibson 1696 edition of Camden’s “Britannia” in English translation. It is superior in appearence to most earlier editions, being a lot less cluttered. I have an extract of West Penwith here (82K). Joel Gascoyne 1699. This is a large scale (just under 1" to the mile) county map completely re-surveyed and containing a gazetteer. It is of historical and national significance being the first county map at this large scale and also the first to show parish boundaries. It was reproduced in facsimile in 1991 by the D&CRS with a commentary by William Ravenhill and O. J. Padel. ISBN 0 901853 34 8. George Bickham 1748. This is an interesting example of what passed for a map in the C18th. It was published in a book called “The British monarchy or description of the dominions of Great Britain”. G. Bickham, London: 1748. A facsimile edition was published by Frank Graham, Newcastle upon Tyne: 1967. The maps are birds-eye oblique views, that of Cornwall being apparently from above the Tamar east of Launceston, hence Penwith is rather distant and distorted. Cary’s County Maps of 1787 have been republished in A4 and A3 sizes on quality paper by MM Publications (Link Broken 17 Mar 2015) of Suffolk. Here is a manageable extract of just West Penwith (122K) from an online site that is no longer live. C. Smith 1801. I know very little about this map but it seems to be a typical C18th map based on earlier surveying but much better engraved. Alan Stanier has a complete scan on his Cornwall (Link Broken 17 Mar 2015) page (370K) or for a more manageable extract of just West Penwith. The Ordnance Survey First Edition 1" series was published from 1809–1813. Sheet 33 was called “Penzance” and was published in 1813. This was subsequently re-engraved in 1824 and 1839. Electrotypes were produced from the 1850’s though to 1887. A facsimile is available from David & Charles, Newton Abbot, Devon: 1970 & 1982. ISBN 0 7153 4403 X. This is reproduced from the 1865 electrotype and is numbered sheet 95 in the David & Charles series. John Cary 1811. Divided into hundreds. Finished size 20" square. C & G Cary 1820. 1/2" to one mile County up to Bodmin only. Other pieces were published separately to form a set for the whole of England and Wales by 1832. Thomas Moule 1836. This again is a county map, part of a very decorative atlas for the whole country. Those for England have been reproduced with an 1842 text and modern colouring in a large format book “The County maps of old England” introduction by Roderick Barron, Studio Editions: 1990. ISBN 1 85170 403 5. A smaller volume is “Moule’s county maps—The west of England” with an introduction by Ashley Baynton-Williams. Bracken Books, London: 1994. ISBN 1 85891 196 6. Plan of the lands in the estates of Hellesvean, Trowan and Ayr in the Parish of St. Ives, the property of Edwin Ley Esq. 1841. 3 chains to one inch, a typical minor estate map. The New Series Ordnance Survey 1" published from 1872. Alan Godfrey Maps have a reproduction of the 1888 edition available [ No. 351 in his catalogue], which includes a large scale plan of St. Just, an extract from 25" sheet LXXIII-2 (1906) described below. The Ordnance Survey 6" series. The first edition was 1880 and the second in 1906–9. Each county was divided into 6 mile by 4 mile sheets which were numbered (usually roman numerals) from West to East and North to South as shown in this diagram. These were printed in quarters marked NW, NE, SW & SE but were often re-assembled on linen for sale in convenient groups as demanded. I have one of these made up from LXI SW/SE (+NE margin) and LXVIII NW/NE 6 miles by 4 which covers St. Ives, Towednack, Zennor and Lelant. It is dated 1891 and has been hand coloured to show the areas covered by some of the tin mines. I also have separate quarter sheets of the second edition dated 1908 LXVII NE (+ LXIA SE inset) Morvah/Zennor, LXVII SE Sancreed/Madron, LXVIII SW Madron/Gulval and LXXVIII NW Sennen/St. Levan (areas marked in pale green on diagram). The first edition 6" maps have been put online by Landmark in 1/16 sheets scanned at 300dpi. These come out at about 120K each so navigation can be a bit slow due to the image size. Report of the Boundary Commissioners for England and Wales—New Divisions of County; Eyre and Spottiswoode, London: 1885. A very useful map as it shows the official boundaries (proposed and presumably adopted) at that time These are online for the whole country at London Ancestor. I have extracted West Penwith. The Ordnance Survey 1:2500 (25") series was first published in 1880. The sheet numbering is the same as for the 6" series above but each one is divided into 16 parts numbered West to East, North to South as shown in this diagram. Often these become available as composite or part maps made up for estate, mining or corporation purposes. I have one which is part of sheet LXXIII-11 (c1910 edition) which covers the tiny area from modern grid ref. 391272 to 406286 (St. Buryan parish) but in sufficient detail to show every building, numbered fields and with the roads true to scale (area marked in pink on diagram). The Ordnance Survey 1:500 series is as big as you can get and then, generally, only in towns. The sheet numbering is the same as for the 25" series above but each one is further divided into 25 parts numbered West to East, North to South in the same fashion as the 6" as shown in this diagram. The reference to a sheet looks like LXXIV 6.3 where the roman numbers are the 6" sheet, the ordinal is the 25" sheet and the sub-ordinal is the 1:500 sheet. I have only ever seen these in libraries but was fortunate to be given a set of copies at reduced (1/3) scale for the town of Penzance. I think that these are dated 1877 and are sheets LXXIV 2.11, 12, 13, 16, 17, 18, 21, 22, 23 and 6.1, 2, 3, 6 & 7 (area marked in yellow on diagram)..
Mackenzie 1895. I know nothing about this map but it seems to be a typical C19th map. Alan Stanier has a complete scan on his Cornwall (Link Broken 17 Mar 2015) page (624K) or for a more manageable extract of just West Penwith. Dixon, E. E. L., MacAlister, D. A., Reid, C. & Wilkinson, B. S. N. 1907. Geological Survey at the six inch scale. Originaly drawn 1898–1903. The 1" Ordnance Survey Third Edition (New Large Sheet Series). This is the first colour series, published from 1905 to 1918, and is useful as it shows (civil) parish boundaries. 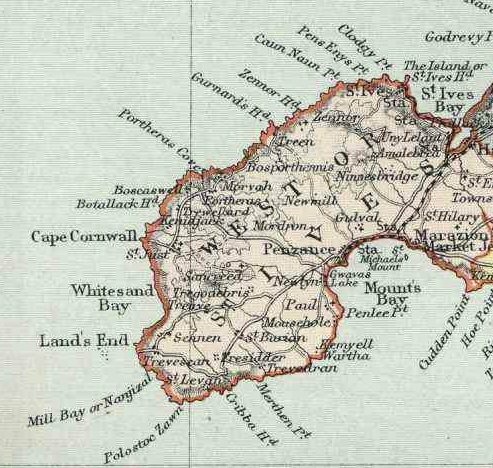 Most of West Penwith is on sheet 151, “Land’s End” (my edition is dated 1911—print code 5.11 dissected onto linen and was distributed by Alfred Wilson, bookseller, London). The Ordnance Survey 1/2" series Sheet 35 “S. 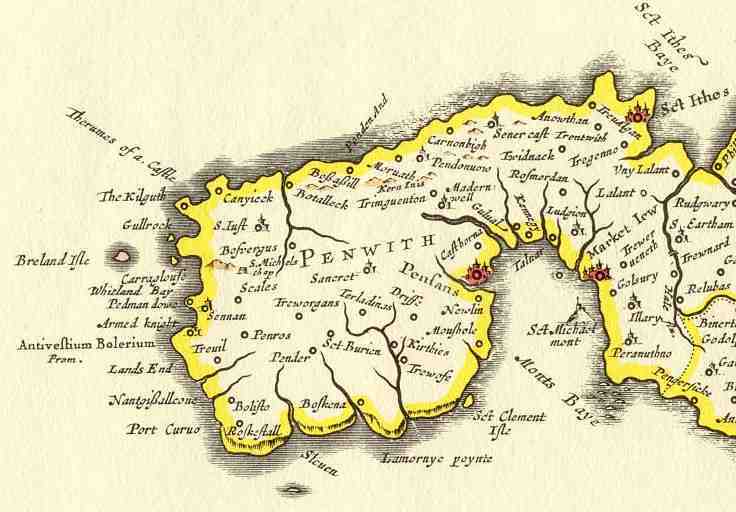 W. Cornwall & Scilly Isles”. My copy, mounted on linen, is dated 1913—print code 3536.R.35-6. The 1" Ordnance Survey (Fourth) Popular Edition. This edition included a grid system which was valid over individual maps of the same edition. Each was divided into squares 2 miles to a side from an origin in the top left corner—numbered along the top and lettered down the sides. It was published from about 1919 to 1926—sheet number 146 shows “Land’s End & Lizard”. My copy is dated 1926—print code 3000/26 with a standard red cover. The 1" Ordnance Survey Fifth Edition. Published from 1934 in a standard and a relief edition. This edition included a precursor to the National Grid—the country was divided into squares 5000 yards to a side from an origin to the south and west of England. This required a reference of two seven or eight digit numbers to locate a point to within 100 yards if the last two digits of each were zero. Sheet number 146 shows “Land’s End & Lizard”. My (standard) copy has print code 5035 (presumably 1935) with a standard blue cover. The National Series 1" Ordnance Survey also called the New Popular or Sixth Edition. The first to include the standardised National Grid reference system of one Km squares and area code letters. This required only two letters and a single six digit number to locate a point to within 100m, sufficient accuracy for most purposes. It was published from 1940 to 1947 and they had also learned how to fold a map for ready reference on the move. Sheet 189 was “Land’s End” which is all in the “SW” grid area. My copy is dated 1946—print code 40,046 with a standard red & buff cover. See also Kain & Oliver 2001 below. Harbour map/chart of St. Ives and Hayle issued by the Hydrographic department of the Admiralty. corrected to 1943 and presumably restricted material for wartime. The Seventh Series 1" Ordnance Survey. This was published from 1952 to 1972. Sheet 189 was “Land’s End”. My copy is dated 1961—print code A with a standard red & buff cover. I also have an uncommon Central Electricity Generating Board edition of this one with the pylon routes marked in greater detail. The Ordnance Survey 2 1/2" series. The sheet numbers required are SW32, 33, 42, 43 and 53. The Ordnance Survey 1:25,000 Pathfinder series. West Penwith requires two sheets—1368 “Land’s End” (was SW 32/42, my edition is dated 1972) and 1364 “St. Ives & Penzance (North)” (was SW 33/43, my edition is dated 1989). The Ordnance Survey 1:100,000 Petty Sessions and Administrative areas map. One sheet for the whole of Cornwall showing clearly showing civil parish boundaries. Goode, A. J. J., Taylor, R. T. & Wilson, A. C. 1970–76. Geological Survey at the six inch scale resurveyed. The current (from 1974) Ordnance Survey 1:50,000 Landranger series. West Penwith is on sheet 203, “The Lizard & Isles of Scilly” (my edition is dated 1989). There is a set of Industrial Archaeology MapNotes for this sheet by I.A.Recordings which guides you to the key sites of the area, especially the mines and related industries. The majority are around Camborne/Redruth but there are a few listed in the West. Brown, G. M. 1984 British Geological Survey sheet 351/358 Penzance; Drawn on the western part of the 1:50,000 sheet 203, 1974 excluding the Isles of Scilly. It was (is?) also available in 20 x 1:10,000 sheets to special order. The current (from 1996) Ordnance Survey 1:25,000 Explorer series. 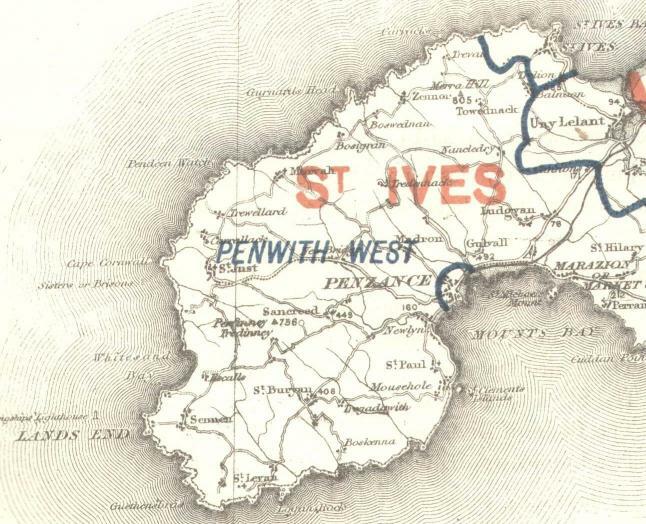 West Penwith is on sheet 102 “Land’s End, Penzance and St. Ives” (previously sheet 7). Estate publications Red Book—Cornwall; Tenterden, Kent:various. ISBN 0-86084-315-7. This modern publication is very useful for locating streets in the larger towns. Kain, Roger J. P. & Oliver, Richard R. Historic parishes of England & Wales; University of Essex, Colchester: 2001. ISBN 0-9540032-0-9 This is an excellent book that acompanies a set of CDROMs (ISBN:0-9540032-1-7) which overlays the 6th series OS map with accurate parish boundaries and also provides a gazetteer of parishes. I can recommend Lesley Aitchison who has a good selection of maps of Cornwall available for sale by post via a monthly catalogue. David Archer Maps has a good range of old Ordnance Survey maps available. See MapPlanet.com for an interesting way to navigate the world. As an aid to reading 1:25,000 Ordnance Survey maps I offer you this little invention. It consists of a 4cm x 4cm square divided into a 4mm grid printed onto clear plastic. It comes in the form of a downloadable GIF file. Save this as a file and print it onto an acetate intended for overhead projectors then cut it out and you are away. If you can’t print to acetate, then print to paper and get a copy shop to transfer it to acetate for you. the only requirement is that your printer must operate at 300DPI and be reasonably accurate in registration. BEWARE—DON’T print it from your browser print button, it will come out much too large, save it to a file and use Paint Shop Pro or another gif editor.